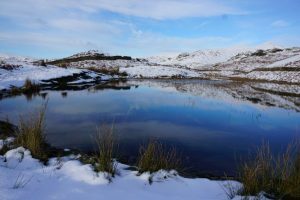 We had some wonderful weather in November, cold with clear blue skies; no wind, so fabulous reflections; beautiful snow on the higher fells and autumn colours at lower levels – what could be better! My friend Hil and I met up to visit Claife Heights viewing station on Windermere. 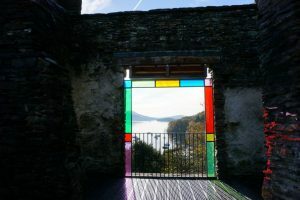 We were not disappointed, stunning views framed with coloured glass, what a concept. We followed this by a walk to Moss Eccles Tarn which was a favourite spot of Beatrix Potter and her husband. 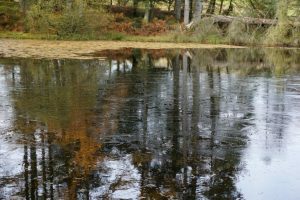 It was beautiful with trees reflected in the ice. 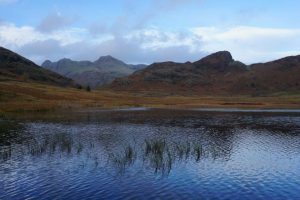 ….and Alcock tarn at Grasmere. We walked there via Nab Scar and were in deep snow at the top. 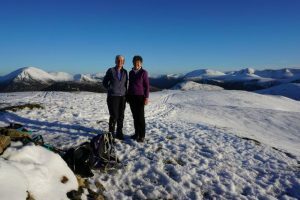 We can’t forget the local fells in such wonderful conditions and Judy and I walked along the ridge from Gavel to Blake and Burnbank. We had our photos taken by the photographer of the Whitehaven News on the top of Blake but I’m not sure whether we appeared in the paper. Crummock is always excellent for reflections and I can’t resist walking down and taking pictures. 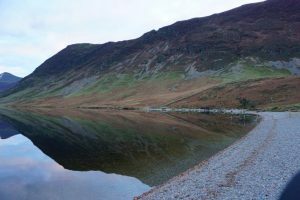 Whilst thinking about Crummock, our local National Trust ranger, Mark, lead our walking group’s Christmas walk through Lanthwaite Wood and around Crummock shoreline. We learned about woodland management, and were shown evidence of charcoal burning, lead ore mining and smelting. The recent floods, disastrous for so many, had revealed fresh evidence of these activities. Beyond the woods, Mark showed us the remains of long abandoned farmsteads and iron age earthworks and solved a mystery for me. I have always wondered why there was a fence going into the lake by the kissing gate – it was in fact a Victorian jetty. Now my daughter says I will bore everyone telling them about it whenever we go down to the lake! Which I probably will as I am so delighted to know what it was!